To ensure your Web site ranks highly with search engines, you need to use keywords that accurately reflect what your site is about. You can then build a subject outline and expand your keyword list to include more theme-related keywords. Natural language: What would I search for to try to find my product? Other perspectives: What would someone else call what I have to sell? Customer mindset: How do “normal” people talk about the products or services I offer? Industry jargon: What do the “experts” call my products or services? Write down whatever you think would be the major keywords you will be using. Ask your friends, ask your relatives, ask your associates, ask your employees and coworkers. It’s a matter of throwing things at the wall to see what sticks and what doesn’t. The above figure shows a simple map outline. Tools like this can help you come up with new topics and concepts that might relate to your site. After you have a large list of keywords that you might want to use, your next step is to create an outline using those keywords. Start with the broadest ones at the top level and break the list into categories and subcategories, getting more specific as you go deeper. You can see how the breakdown goes from very broad terms to more specific terms. These all represent things that people might search for when they are looking up classic cars, or customization, or both, and can all be used as keywords. This is a very small, simple outline. You can go into even more breakdowns and come up with even more specific keywords as appropriate for your site. Remember to list as many keywords that relate to your theme as you can. The broader base you have to work with, the better chances you have of identifying good, solid, relevant keywords. Now, take your nice, long list of hundreds of potential keywords and go through and match them to your theme. Figure out whether you will be doing custom work for a Ford Anglia as opposed to Ford Mustangs, and whether you want to include Dodge at all. 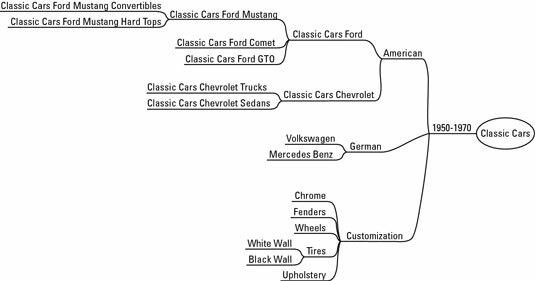 Also start thinking about keyword phrases, like Ford Mustang convertible or 1960s Ford Mustang hardtops. Qualifiers such as convertible or 1960s thrown in at the beginning and end of a main keyword turn it into a keyword phrase, and they help you figure out how narrow you want the search to be. This is especially important if you have a local business because you want to rank for the local search query, such as Poughkeepsie classic car customization. When you feel like you have some good usable keywords, drag out your thesaurus and look up synonyms for those words. Anything that relates to your keyword or has the same meaning is another good keyword. 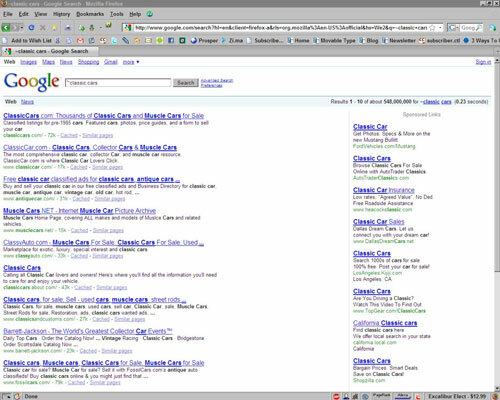 Using a tilde before a word in a query triggers a synonym search in Google for [~classic cars]. Notice the bold terms in the titles and descriptions. Don’t forget to use the search engines to discover synonyms. As shown in the above figure, the tilde character (~) before any word in a query triggers a synonym search in Google. In the query ~classic cars, “classic” is the word that you’re looking for synonyms for. In the search engine results pages (SERPs), words like antique and muscle are bolded in addition to the searched words classic and cars.